A TMJ is essentially a disc that connects a person’s jawbone to their skull. TMJ disorders can be painful and frequently disabling disorders that involve pain the jaw joints and surrounding tissues as well as a limitation on jaw movements. TMJ symptoms can include migraine headaches, lockjaw, neck and shoulder pain, or vertigo. TMJA further notes that TMH may involve multiple causes, and there are also cases in which no cause can be determined. 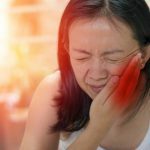 The most common symptoms of TMJ disorders are usually some kind of pain, usually in the jaw but also possibly in the face or around the ear. Difficulty opening or closing a jaw could also be a sign of a TMJ disorder. The ADA notes that there are several treatments for TMJ disorders, and the National Institute of Dental and Craniofacial Research (NIDCR) recommends what it refers to as a “less is often best” approach in treating TMJ disorders. The simpler treatment is typically recommended before a more involved treatment, and the initial steps might include eating softer foods, avoiding chewing gum and biting your nails, modifying the pain with heat packs, or practicing relaxation techniques to control jaw tension, such as meditation. Babylon Dental Care provides top of the line dental care including cosmetic dentistry and restorative dentistry services to our clients. Call (631) 983-6665 or contact us online to see how our team can help you.